Another week of my little boys life captured in a daily picture, how I've managed to keep this up I don't know, I'm really looking forward to looking back on all of these on January 1st 2015 and printing them out to put in their own album for safe-keeping. On Saturday my boy was teething badly, he was crying almost all day and just wasn't a happy bunny at all, until I put him in the bath that is! 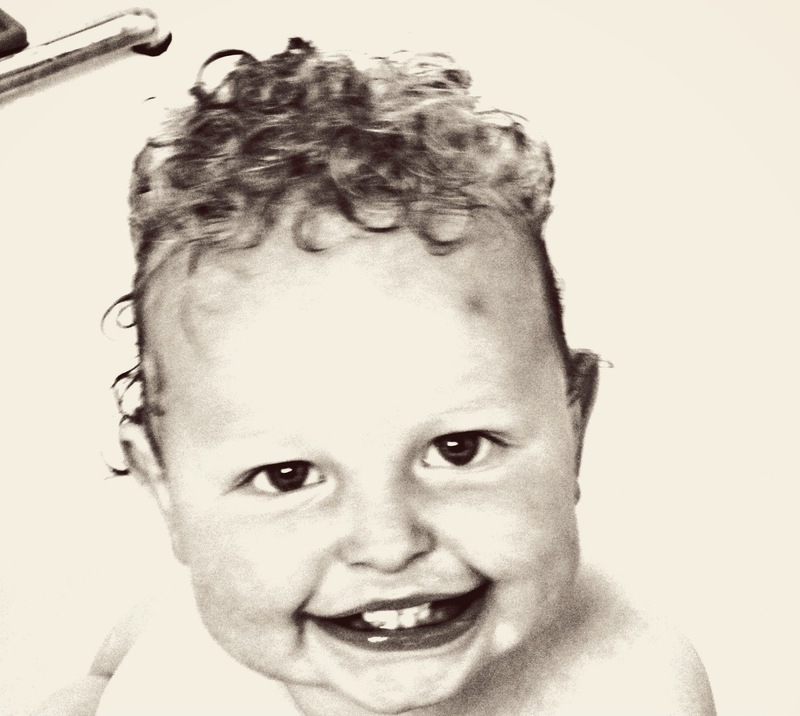 When he starting splashing around and playing with his rubber ducky he was full of smiles, I love this shot of him, I had to edit it in black and white as it was a bit blurry, he never sits still! We spent Sunday together as a family as Daddy had a precious day off. We were out in the garden in between the rain showers and filled up the paddling pool for Tyler Lee to splash around in with his play balls. He just liked crouching down at the side of the pool though, preferring to watch Daddy splash around instead. On Monday I went out to the kitchen to spot my boys in the garden surrounded by bubbles. Jacek was blowing lots of bubbles to Tyler Lee and he was loving it. 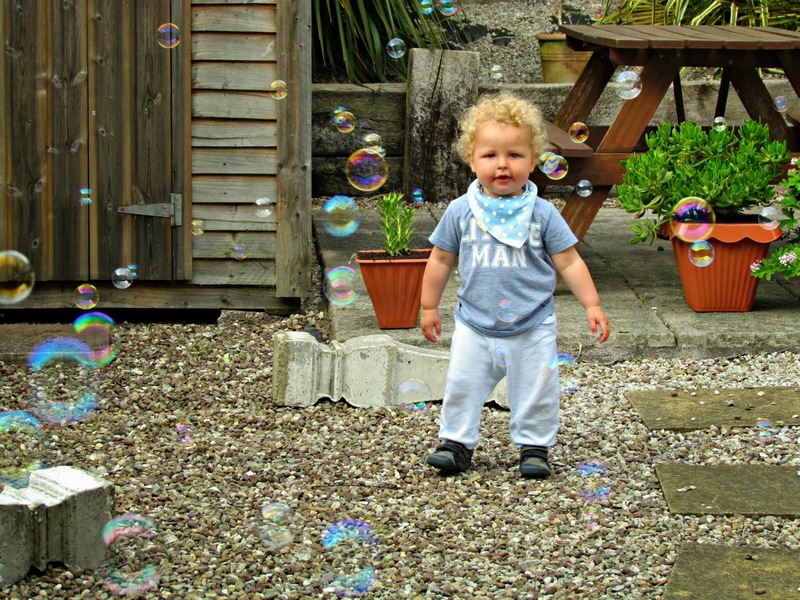 I love this shot I captured of my boy amid the bubbles and he was looking right at me so magical..
On Tuesday Tyler Lee proved he really is a boy after his mothers own heart when he proved to have a penchant for Magnum ice-creams, a favourite of mine since I was a child. He seemed to love the chocolate coating, my secret ice-cream stash is no longer safe! I've had a really hard time trying to get my boy to sleep as of late and on Wednesday this site greeted me when I went up to check if he was sleeping soundly, chance would be a fine thing! The little scallywag had lent over the side of his cot and grabbed all the books from the bookcase and stashed them into his cot, tearing some pages along the way. I know everyone likes a bed-time story but really?! 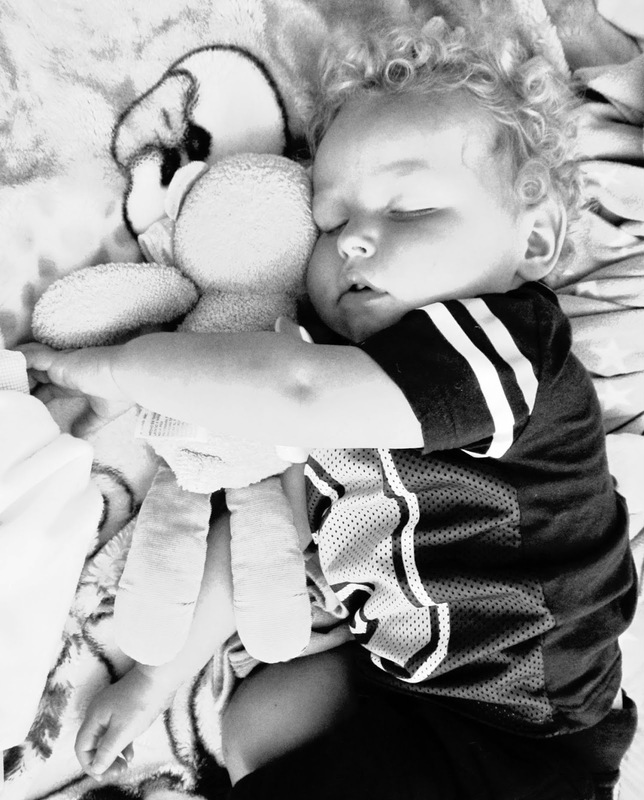 On Thursday my boy did go for a nice peaceful nap, no book tearing occurred this time and I caught him like this, cuddling up to him bear, such a sweet sight. What a little angel. On Friday my boy went to bed peacefully once again, I found him snuggled up to his favourite friend, his PupPup comforter. A lovely moment to end another week of his #Project365. His hair is just so cute!!! !